Pesto has got to be one of the most versatile spreads in the world. And so easy to personalize. Pesto is just a combination of greens/ herbs, nuts and cheese with a wonderful addition of olive oil. Here is a wonderfully easy recipe for pesto. Feel free to use any combination of greens/ herbs and nuts. Some good ideas are spinach, basil or even sun-dried tomatoes. And any nuts at all. I like to go with a sharper cheese, and hard cheeses seem to give it a nice texture, but feel free to use a creamy cheese (like goat's). Pulse the cilantro and nuts in a mixer. Add garlic and pulse. Pour the oil into the mixer in a constant stream while continuing to pulse. Mix in the cheese and pulse until thoroughly combined. Add salt and pepper at the end. Pesto & Garlic Bread, Gnocchi, Pizza, Mushroom Soup and Pesto Toast and Bites of Toast. I recently went to a modern Andhra restaurant, Maya, in Chennai. Andhra Pradesh is a small state in southern India, whose cuisine is typically very spicy and loaded with masala, tamarind and ground spices. This restaurant surprised me though. The food was mild, full of subtle flavors and delicious. The one dish that really stood out to me was the lovely spinach rice. I asked my waiter if he could give me the recipe and he, very graciously, told me the ingredients. 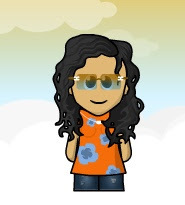 So I made an attempt at it, and thankfully, it turned out exactly how I'd hoped. (I've added peas to this rice, in order to get in more veggies, but the original recipe didn't have it, so feel free to leave it out). Heat the oil in a small pan. Add the mustard seeds and urad dal and stir until mustard seeds begin to pop. Add the onions and green chillies and cook until the onions are transparent. Now add the spinach. Continue stirring/ cooking until wilted. Mix in the cooked rice, peas and salt and fold until fully combined with the spinach mixture. Delicious! Even my I-won't-eat-anything-green daughter ate it without a complaint! I'm always looking for fun and healthy food to bake with my daughter. 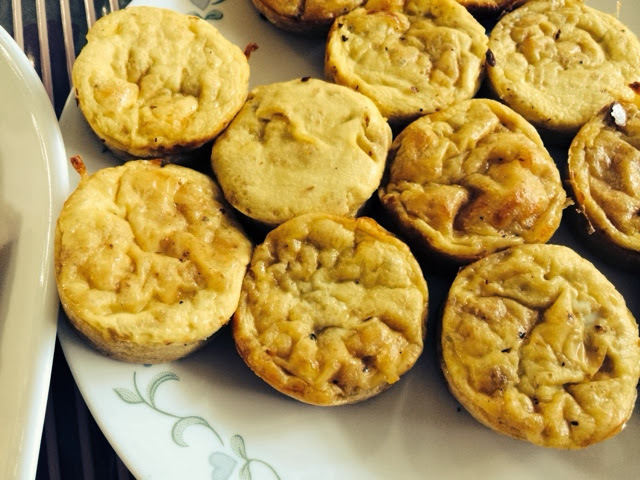 When I came across Divya's post in her blog, Easy Cooking, on Eggless Apple Banana Muffins, they sounded perfect. I was fine with using eggs, but decided to just follow her recipe. I made a couple of changes though, I added some chopped walnuts, and a small fistful of chocolate chips. Mix together the mashed bananas, sugar and vanilla until the sugar is well blended. Whisk in the melted and cooled butter. Mix together the dry ingredients (flour, baking powder, baking soda, cinnamon, apple and salt). Fold in the dry ingredients with the wet ingredients. Spoon the batter into a greased and lined muffin pan. Bake for 25 minutes, or until a toothpick inserted in the center comes out clean. The muffins are absolutely delicious. And both my daughters ate them as they came out of the oven! Thanks for a great recipe, Divya. And I'm excited this is my first eggless muffin recipe, and it's already a keeper. An ebleskiver is a traditional Danish pancake, in the shape of a sphere. They taste like American pancakes, but are light and fluffy. They are made in special pans, which have several hemispherical indentations. 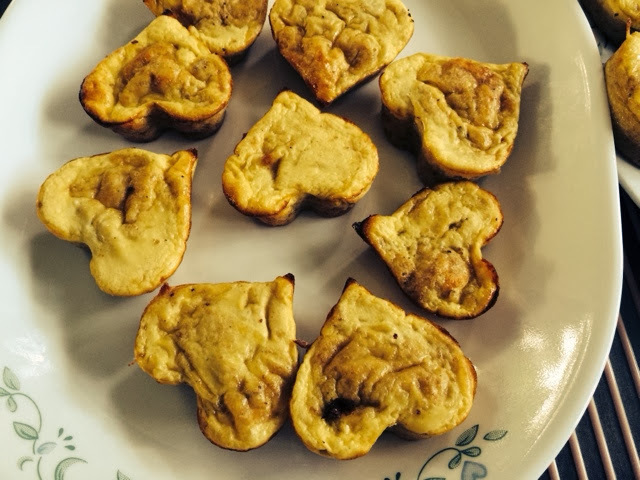 In India, we use an ebleskiver pan to make kuzhi paniharam, and I've made an egg curry with it too. It's an extremely versatile pan. A friend recently gave me an ebelskiver cookbook, Copenhagen for Dessert. I was delighted to find that they are simple to make and very easy to personalize. I made two kinds - one with chocolate chips and another like a jelly doughnut (with jam in the center). The basic batter is the same for both. I used a plain batter for the chocolate chips and a vanilla batter (that is, basic with vanilla) for the jam version. In a large bowl, whisk together the flour, sugar, baking powder, and salt. In a small bowl, lightly whisk the egg yolks, then whisk in the milk, melted butter and vanilla extract (if using). Add the yolk mixture to the flour mixture and, using a wooden spoon, stir until well blended. The batter will be lumpy. In a clean bowl, using an electric mixer on high speed, beat the egg whites until stiff, but not dry and peaks form. Using a spatula, fold about a third of the egg whites into the batter to lighten it, then fold in the rest of the egg whites (and chocolate chips, if using) just until no white streaks remain. Use the batter right away. Brush the wells of the pan with some of the melted butter and place over medium heat. When the butter starts to bubble, add about 1 tbsp batter to each well. If adding the jam: Working quickly, carefully spoon about 1 tsp of the jam into the center of each pancake. Top each with another 1 tbsp batter. Cook until the bottoms of the pancakes are lightly browned and crisp, 3-4 minutes. Use 2 short wooden skewers or dessert spoons to turn all the pancakes and cook until lightly browned on the second side, about 3 minutes longer. Transfer the finished pancakes to a platter or keep warm in the oven. Serve right away. Can't wait to make a savory version! I was asked to bring a salad to a dinner last night. My family and I brainstormed on a fun new salad. Someone first suggested zucchini and cucumber together because of the similar textures and flavors. Then green apple and green bell pepper for crunch and color. I have a good yogurt dressing recipe, so decided to go with that. And for extra crunch, we decided to add peanuts. In the last minute I added some crushed red pepper for extra zing. It was a true culmination of ideas. It reminded me of a video of chef Grant Achatz coming up with ideas for new dishes - something called Flavor Bouncing. Watch the video - it's very cool. How exciting to be doing this for a living!! Heat a pot of water to boiling. 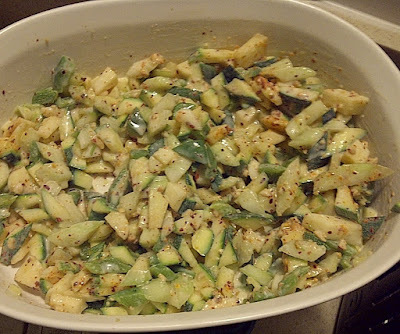 Drop in the bell pepper and zucchini, and quickly blanch for a minute and drain. Cool completely. Store the chopped cucumber and apple in the refrigerator until ready to use. Combine all ingredients for the dressing (except for the mint), keep aside. Just before serving, toss the salad with the dressing, garnish with the mint leaves and serve. This is a forgiving recipe. Feel free to use substitutions, or leave out any of the vegetables you don't enjoy. Also a nice touch would be to cut the veggies into long strips. The dressing is a keeper recipe though. So you might have seen my first attempt at biscotti, Nutella and Chocolate Chip Biscotti. The recipe is so great and so flexible. Someone gave me some fresh dates, and I couldn't pass up using them in the biscotti. While looking through some ideas on the reliable Food Blog Search, I came across an interesting combination - banana chips and dates - on one of my favorite blogs, Apple and Spice. The chips gave it that much-appreciated crunch and saltiness. The dates made it sweet and flavorful. Sieve all the dry ingredients together and keep aside. In another bowl, whip the eggs with an electric blender until frothy. Add the sugar and beat again. Fold the flour mixture into the egg mixture. Fold in the chips and dates. Pour the batter into a rectangular baking pan. Bake for 25 minutes. Remove from oven and turn the oven down to 150 deg C. Using a serrated knife, cut the cake into long strips. Turn the strips over onto their side, arrange on the baking sheet and bake for 12 minutes. Turn the biscotti onto the other side and bake for a further 12 minutes. Remove from oven, and cool completely on a wire rack. We were recently invited to a cook-out by some good friends. A cook-out is exactly what it sounds like - gas stoves and pans set up outside in the garden. The kids played frisbee while the men cooked. It was a perfect summer evening. One of my friends made the most amazing mushroom risotto. Who knew that risotto was so simple to make. I came back feeling completely inspired to make it at home the next evening. Thanks, Vedant, for showing me its easy to make risotto! To make the broth, cook the mushrooms in the water on low heat for about 20-30 minutes. Do not strain. Take off the heat. If using the next day, let the broth cool completely and store closed in the refrigerator. 3 cups Mushrooms, again, a variety of mushrooms would be a good idea. I had only button, so I went with that. Heat a pan with a tablespoon of oil. Add the mushrooms, and let cook until tender. Add the onions and chillies. Keep stirring until onions are soft and well cooked. Now add the rice and let cook until slightly toasted and the water has been absorbed. Now begin adding ladlefuls of the broth, one at a time, each time making sure the broth has been fully absorbed before adding the next. Keep adding until the rice is cooked but still has some bite, and is al dente. Vedant pooh pooh-ed recipes. He cooks by instinct, so I have given approximate quantities here too. I recently got a wonderful cookbook called Complete Book of Indian Cooking by Suneeta Vaswani. Its filled with 350 delicious recipes and beautiful photographs. This one was particularly good. And quite healthy too. In a saucepan of boiling water, cook whole potatoes until tender, 20 to 25 minutes. Drain, peel and mash. In a bowl, mix together potatoes, spinach, peas, chillies, ginger, cilantro, chaat masala, cornstarch and salt, until well blended. Divide into 12 portions. Form into 2-inch round patties. In a large non-stick skillet, heat 2 tbsp of the oil over medium heat. Add 6 patties at a time and pan fry on both sides until golden brown, about 2 minutes per side. Drain on paper towels. Serve hot with chutney or ketchup. Here's the next installment of the newly-formed Baking Club. Last month, we made mango pound cake and this time we decided to try something none of us had baked before, Biscotti. I was a bit apprehensive. I've tasted bad biscotti - too dense or too eggy. I was hoping mine would turn out well the first time and then I could be confident to try other recipes. Well, this turned out just perfect. I followed the recipe from Baking Bites, making a few adjustments along the way. All the recipes on that blog are just amazing and fail-safe. Biscotti are easy to make. And if I'm saying that, let me tell you, its really very easy. You mix all the dough ingredients together, shape into a 1/2" thick rectangle and bake. Remove the baked log, cut into strips, turn the strips over onto their side and bake again. Now remove and turn the strips over onto their other side and bake again. There is not much more to it. Absolutely perfect biscotti. I got about 14 biscotti, but maybe I should've cut them thinner? Sieve all the dry ingredients together (that is, the flour, baking powder, baking soda, salt and cocoa powder). In a separate bowl, whip the eggs in an electric blender until frothy. Add the sugar and beat again. And the nutella and beat. Now fold the flour mixture into the egg mixture until just combined. Fold in the chocolate chips. Since I'd used the same number of eggs, but halved the other ingredients, my batter was runny, and I couldn't shape it. So I poured the batter into a small rectangular baking pan and hoped for the best. Bake for 25 minutes. Remove from oven and turn the oven down to 150 deg C. I took out what resembled a crumbly cake. Using a serrated knife, I cut the cake into long strips. Turn the strips over onto their side, arrange on the baking sheet and bake for 12 minutes. Turn the biscotti onto the other side and bake for a further 12 minutes. Remove from oven and cool completely on a wire rack. You could also dip the biscotti into melted chocolate to get a triple chocolate effect. Or you could add nuts, orange peel... the possibilities are endless with biscotti. I cant wait to try other variations. But I know that I'll never need another recipe. This one was perfect! Check out the biscotti from my fellow Baking Clubbers: Arundati, Arundhati, Nandita and Aparna. My daughter has a lovely Angelina Ballerina book, and it had this one recipe. She insisted we try it, and though I didn't think it would turn out great, we gave it a shot. These were some of the best pies I'd tasted! Goes to show, the best recipes come from the most unusual sources! Bring the milk to a boil in a saucepan. Place the breadcrumbs in a bowl and carefully add the hot milk. Then mix in the cheese. In another bowl, lightly beat the eggs. Add them to the milk and breadcrumbs and stir in the mustard. Season with salt and pepper. Butter the muffin tins and pour in the batter. Bake in the oven for 25-30 minutes, until lightly set and golden. These are delicious hot or cold. In a pan, cook the fish fully submerged in hot water, with 2-3 garlic pods, salt and the curry leaves. Boil the fish for 10-12 mts. When boiled, strain the fish and discard the garlic, water and curry leaves. Mash the fish into crumbs. Heat the butter in a pan, add the minced onion and garlic and saute for 3-4 mts. Add the crumbled fish. Saute for another 3-4 mts. Remove from heat and transfer to another bowl. Add more salt, pepper and 1 cup breadcrumbs and mix together. Shape into balls and flatten slightly. Heat a pan with the oil. Dip the cutlets into the beaten eggs, and then into the remaining 1 cup bread crumbs. Coat well. Put the cutlets onto the heated pan and allow to brown slightly and then flip over, until both sides are a golden brown. Idlis are a huge south Indian favorite! Steamed flour and lentil dumplings are a lovely comfort food for breakfast, lunch, a snack or even dinner. Usually the idlis are eaten with a spicy chutney, milagai podi (a spicy blend of roasted spices) or sambar. Its difficult to find perfectly soft idlis, even in the heart of southern India. Here is a sure-fire recipe to get that perfect texture. 2 cups Idli Rice. This is a special kind of rice, available in most Indian supermarkets. 2 tbsp Rock Salt, or ordinary table salt. Soak the rice and dal separately for 2 hours each.Strain and wash the dal well. Grind with minimal water for about 45 minutes, sprinkling water every 10 minutes and scraping down the sides. The dal will double in volume. Keep aside. Now strain and wash the rice well. Grind with minimal water for about 30 minutes, sprinkling water every 10 minutes and scraping down the sides. The ground rice will have a coarser texture than the ground dal. Mix the ground rice and dal together and add about 2 tablespoons of rock salt. Mix well while simultaneously dissolving the rock salt in the mixture.Keep aside covered in a warm place for about 8-10 hours, depending on the warmth. Warmer the better. The batter will double in volume. Heat a deep steamer with about 2 inches of water at the bottom. Oil the idli plate (see picture), and add one ladle of batter for each idli. Place the idli plate into the steamer, making sure the water doesn't reach the pan. Close and steam for 10 minutes or until idlis are firm (when a skewer is inserted into the middle of the idli, it comes out clean). Scoop out the idli with a spoon after it has slightly cooled down. Enjoy with your favorite accompaniment. In the hot summer in India, there's nothing nicer than these cool pachadis. Pachadi is an Indian term for plain yogurt, mixed with fruit or vegetable and seasoned with spices. The most common ones are cucumber, onion and tomato. Apple pachadi is quite unusual but its absolutely wonderful! Grind the coconut and green chillies together. Mix together with the yogurt and the apples. Heat a teaspoon of oil in a pan and add the mustard seeds and urad dal. When the mustard seeds start to splutter, add to the yogurt-apple mixture. Sprinkle with cilantro leaves and add salt to taste. Mix together. Here's another really easy bread and tastes of sweet honey goodness! Cream butter and sugar together. Add honey and cream again. Add the egg, beat well. Now alternately add the flour and milk, starting and ending with flour. Beat well. Pour into a buttered loaf pan. Bake for an hour until a skewer comes out clean when inserted into the middle of the loaf. Enjoy. Okay, a recipe couldn't get any easier. I got this from a weight watcher's recipe a long time ago. Its a really easy recipe, and quite a favorite at home. The sauce tastes like an imitation barbecue sauce and gives it a great flavor. Brown the chicken with some cooking spray. Mix the cola and ketchup and pour over the chicken. Cook, covered, on low for about 25-30 minutes. Remove the chicken breast, increase the heat to medium high and cook till sauce thickens. Serve the chicken with the sauce spooned on top. Hmm. Actually these should be called Potato Balls - they're made from potato and have NO CHEESE. But we've always called them cheese balls. I have no idea why! The oil that I used got too hot, and thats why these are darker than usual, but still taste so good! Heat the oil on low for deep frying in a shallow, flat-bottomed pan. In another pan, heat the ghee and water together. When it starts to boil, remove the pan from heat. Slowly - VERY slowly - add the flour a little bit at a time, whisking furiously the whole time, so lumps don't form. After all the flour has been added, add the mashed potatoes and salt and stir/ mash to combine completely. Make little marble-sized balls from the potato mixture. Slowly lower 4-5 balls at a time into the oil and fry until golden brown or darker. Drain on a tissue-lined colander. Serve warm with ketchup or chutney.